Weighed in this morning at 165 pounds, up from yesterday. And that was my goal for all this week, to hit 165 by this morning. Yesterday was a non-diet day. I had a salad at Sizzler, consisiting of just spinach, tomatoes, cucumbers, topped with salsa, and a plate of pineapple and tangerine slices. And a Diet Coke. I also had four bottles of water, and a bottle of Fruit2O. But I still ate 8oz of jerky too! And then I did my usual exercises, 2-mile jog in the morning, 1-mile jog in the evening, and 2 sets of sit-ups, crunches, and push-ups. I continue to improve on the push-ups, I'm doing about 12 reps consistently, whereas I used to be only able to do 9-10 reps.. Sometimes I'm able to muster as much as 14. 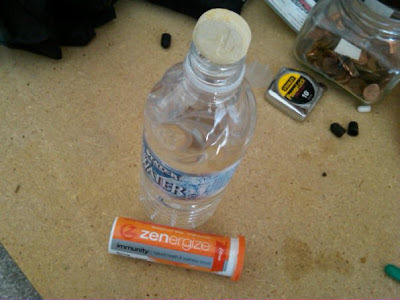 Yesterday I bought a package of these Zenergize Tablets. These are tablets you drop into a bottle of water to add some flavor and vitamins. I figured it might be good since it only added 2 calories and 0.5gm carbs. I picked them up at my local grocery store. Only problem, is that they made the tablet too big to fit in a bottle. However, I found that they break apart pretty easily. They fizz up like soda tablets. As for the taste, well these "Citrus" flavored tablets are ok, but not quite like the flavor of Tang, or orange Kool-Aid. Though still better than Alka Seltzer. But they're packed with a lot of vitamins, which is something I need since the beef jerky diet tends to deprive me of those. They also make a Green Tea variety which is said to help boost metabolism, so maybe I'll try that one next.